>> When Are Faith and Religion Allowed in Public Schools? When Are Faith and Religion Allowed in Public Schools? I struggle sometimes with how to help my public school students without being able to talk to them about my faith. I know a relationship with God would help so many of them. I just try to be the best example I can and hope that is enough. This is the cry of so many Christian teachers’ hearts – an understanding that our students need Christ but the realization that we cannot openly share with them the truths that could change their lives. But what if I were to tell you that religious discussions are not quite as taboo as you might think. Today I’m speaking with Finn Laursen, director of CEAI, about what is and isn’t legal for Christian teachers in the public school, and you may be surprised to discover just how much freedom you actually have. Disclaimer: Neither I nor my guest Finn Laursen are legal professionals, and although we are discussing legal matters, this is NOT intended as professional legal advice. If you need legal advice, please seek a legal professional for help. Finn Laursen is the director of CEAI (Christian Educators’ Association International). Finn has served for 32 years in the public school as a teacher, counselor, principal, and superintendent. He now serves as the director of CEAI and has a passion for understanding & explaining what is legal and constitutional for Christian teachers in public schools. He’s spoken at the National School Board Association, been called as an expert witness in federal court, and even took part taking a case on behalf of teachers all the way to the U.S. Supreme Court. The First Amendment states: Congress shall make no law respecting an establishment of religion, or prohibiting the free exercise thereof; or abridging the freedom of speech, or of the press; or the right of the people peaceably to assemble, and to petition the Government for a redress of grievances. We discussed in detail last week in this article that this phrase was never intended to keep religion out of the government but was instead intended to keep the government out of religion. But, none the less, the court ruling in the ‘60’s changed how this phrase is applied now in the public school system. So let’s translate this into what it means now in your classroom. According to current interpretation, you as a public school teacher are an agent of the government and are not allowed to establish a religion. What does it mean to “establish” a religion? At the same time, you are not allowed to inhibit the expression of religion either. It is a violation of the First Amendment for a teacher to stop a student from expressing religion – to keep students from carrying Bibles, talking about what they believe, or writing a report on Jesus as a historical figure. Live out your faith in your daily life. You are absolutely permitted to live out the tenants of faith in your daily interactions. For example, to follow Jesus’ command to “Let no corrupt word proceed out of your mouth, but what is good for necessary edification, that it may impart grace to the hearers”(Eph 4:29) is not only permitted but is a wonderful testimony. So love your students, be patient with them, and treat them with the utmost respect as those who are created in the image of God. Live your life by Biblical principles such as the Golden Rule, and people will notice the difference – maybe even ask you about it. Openly answer questions posed to you about what you believe. The courts have made clear that the First Amendment guarantees freedom of speech and that if you as public school teacher are asked about something related to your faith, you may honestly answer the question. What you may not do is to then follow it up with “and you must believe that too.” Trying to convert a student would be considered establishing a religion. You are absolutely allowed to pray privately for your students, and don’t underestimate this for a second. Prayer is not this last-ditch attempt we make when we have nothing left to try (i.e. “All we can do is pray.”) No, it is direct intercession to the very throne room of the Almighty God who controls everything. What could possibly make a bigger difference than that? 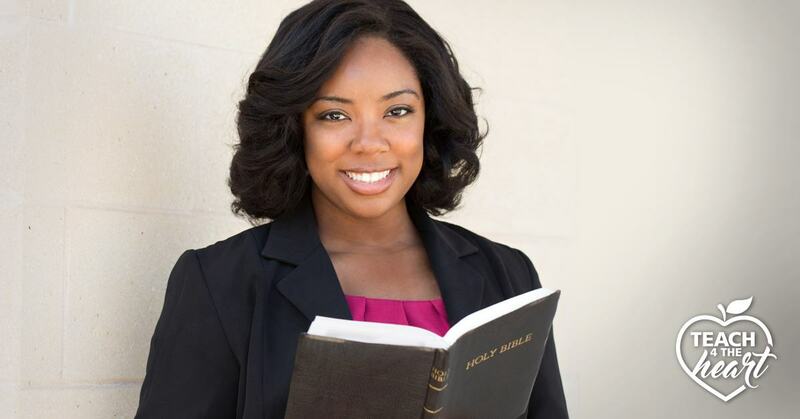 Incorporate the study of the Bible & religion into your course content. You may be surprised to discover that you, as a public school teacher, are allowed to teach about religion, about religious holidays, and even about the Bible. You just can’t preach or do anything that would establish a religion. Thousands of public high schools teach a Bible course – viewing the Bible as literature or as a study on how the Bible has impacted culture, art, or music. Now, to teach that the Bible is the infallible Word of God would be to establish a religion and thus not permitted. But to teach about the Bible and how different religions view it is an academic study and thus acceptable. And if a student wants to mention that in their house they believe & practice the Bible, that is their right to speak openly, and you haven’t established a religion at all. All you’ve done is provided a safe place for students to discuss their own views in a respectful way. Almost every subject brings opportunity to discuss religion or the Bible in an academic way. Literature, for example, contains a plethora of Biblical allusions that cannot be readily understood without understanding the Biblical reference. The school’s approach to religion is academic, not devotional. Supervise religions clubs, See You at the Pole, Good News Clubs, etc.Many schools have religious clubs that are student-led but need faculty advisors. This is a great opportunity not only to reach out to students but to also teach them what they are allowed to bring up in class. There are absolutely no restrictions on what students are allowed to bring up in the classroom because a teacher, as a government agent, is not allowed to inhibit the free expression of religion. And when the students in your school understand this, then they can indeed be a great witness among their peers. You can also be present at events like See You at the Pole. You cannot lead the prayer or the event, but you are certainly allowed to supervise the event and support the students in that way. And you might be amazed what doors open up simply by your being there. Don’t allow fear to paralyze you. You may be thinking right now that when you enrich your lesson with a discussion about religion, even though it’s totally legal, there will inevitably still be parents who go to your administrator and complain. But here’s the question: Will fear stop us from moving forward?You as a teacher have academic freedom. You obviously need to teach the curriculum, but you clearly have the ability to go beyond curriculum & good teachers do this all the time. Does this mean you won’t get complaints? No. But when you’re called on the carpet, just be ready with the academic reason for why you included the topic in your lesson. If you never want a complaint, then maybe you should avoid it altogether. But when we realize we are full-time missionaries sent to a foreign culture in the public school, it will change our attitude and priorities. When you keep in mind eternity, dealing with an ungrounded complaint is worth it, isn’t it? If your administrator reprimands you, realize that s/he may not even be aware of what is legal and permitted. So be prepared to kindly educate him/her, but above all, remember Biblical principles in all your interactions. Pray for those who oppose you, be respectful of and submissive to authority. Know your rights, but don’t demand them. And allow your humble attitude to be a bright light that God can use to break down barriers. 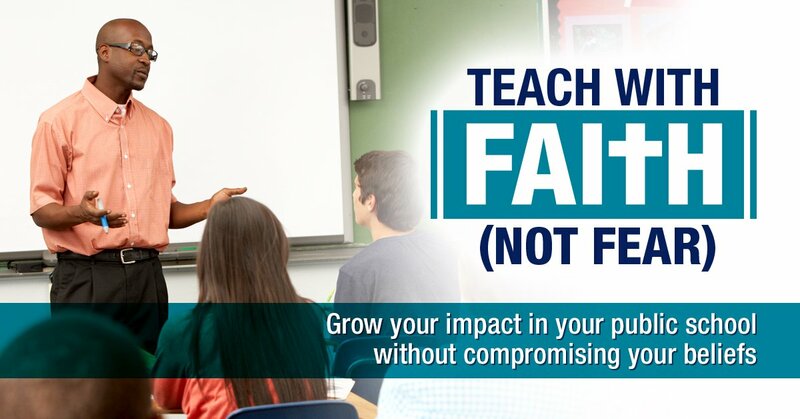 Join the FREE Teach with Faith, not Fear training. Teach 4 the Heart is a community of Christian teacher who desire to see God change lives through us. Join with us to receive support and encouragement each Monday via email. 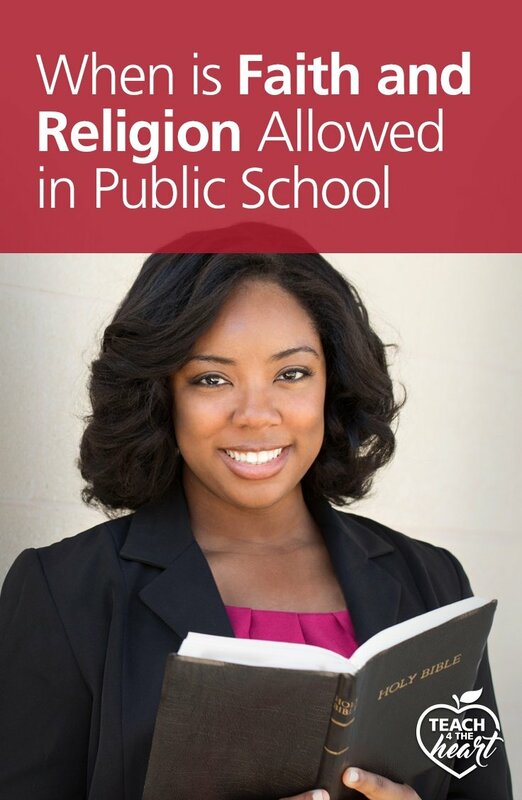 Ask an attorney a question about your religious freedom in the public school. Download the Shine Like Stars Bible Study. CEAI also offers a variety of services to Christian teachers in the public schools, including liability insurance and a Christian alternative to the public school unions. Find out more about the benefits of joining CEAI. Know other teachers who would love to know how they can legally discuss faith in the classroom? Share this article with them now! Linda- Thanks so much for your Internet posts. They are so helpful! Linda, thanks so much for taking the time to clearly and simply state the rules and laws of religion, public education, and teachers. I think there is a real need for clarity on this issue. I have been especially concerned for the past several years about how students rights are being trampled. You have a direct and focused writing style and I know that you are a great blessing to many teachers and students! Thank you for all the time you spend on this website! My heart is heavy this morning. I am a teacher. I help a refugee family that came from Africa, from the poorest of poor schools. They study Christianity in her school back home. Recently she has been shocked of how the teacher tells her to not talk about God, leads talks about leaving “under God” out of the pledge (everyone in class supported the leaving it out, except the girl). They are allowed and even sort of encouraged to listen to inappropriate music. She is confused and I am furious! What are our rights on such a matter. What is an appropriate way to address this?